I hope you are planing to attend the 2014 Lean Six Sigma Higher Education Conference at HAN University, in Arnhem, The Netherlands, on 2-3 June 2014. For more information, visit the conference home page. 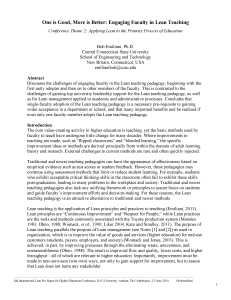 In addition to speaking at the conference, I am presenting a paper “One is Good, More is Better: Engaging Faculty in Lean Teaching.” Click on image below to read the paper. In the workshop, I will describe how I have used Lean principles and practices to improve my teaching over the last 15 years. Participants will learn a different way of thinking about teaching and gain a clear understanding of how to apply Lean to their own courses to improve student engagement and learning outcomes. It’s going to be a great conference. You will hear inspiring talks, have the opportunity to engage in substantive conversation, and develop new relationships with global leaders in Lean for higher education. Excellent – Yes it needs more Lean understanding way before entering the workplace. h/t Bob for your continuous work on bringing Lean thinking to broader understanding, and audience.